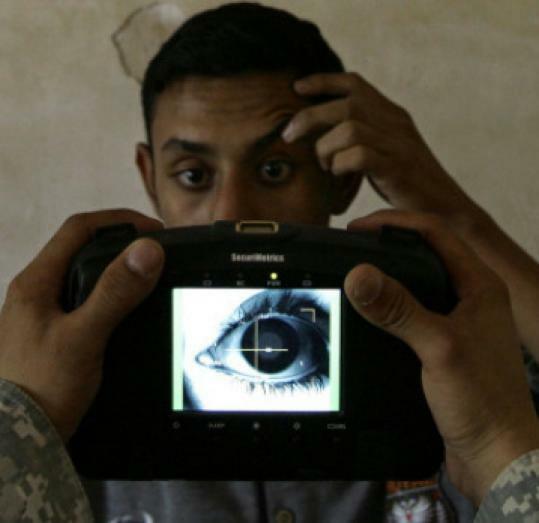 WASHINGTON — Over the past seven years, US soldiers in Iraq have used sweeping wartime powers to collect fingerprints, iris scans, and even DNA from ordinary people and suspected insurgents, an effort that has helped the Pentagon amass one of the world’s most comprehensive databases of biometric information collected during a war. As the war draws down, however, the collection of so much personal information has raised questions about how data gathered during wartime should be used during times of peace, and with whom that information should be shared. Now, as President Obama tonight is slated to address the nation about the end of combat operations in Iraq, these concerns about the transfer of intelligence are being put to the test. Nearly 7 percent of Iraq’s 29 million people are cataloged — their names, facial scans, and often other details about them, such as whether they were considered a friend or foe. Now, US officials are debating about how much of the powerful data should be shared with Iraq and how much Iraq’s own troubled security forces should be encouraged to continue collecting information. Some Iraqis fear that the transfer of data to their government could create a “hit list’’ of Iraqis who worked with the US military or a tool for settling ethnic or sectarian scores. “Those people, they trusted the US government and worked with them,’’ said Naseer Nouri, 52, who helps run an organization to assist Iraqi refugees in adjusting to life in the United States. Nouri said he and many of these refugees left Iraq after their lives were threatened for working with Americans, in some cases by militia fighters who are now part of the Iraqi police. “How can [the US forces] betray them like this and forward their information to the Iraqi government?’’ he said. Human Rights Watch and the Electronic Privacy Information Center, a nonprofit privacy advocacy group, have also raised concerns about the data. But Lieutenant Colonel Thomas Pratt , chief of the Military Operations Branch of the military’s Biometrics Identity Management Agency, said Iraq needs much of the information to combat terrorists and insurgents. He said that portions of the fingerprint files will be transferred to the Iraqi government and that if the Iraqis choose to buy the sophisticated equipment for use of the iris data, that information will be transferred as well. Iraqi forces are also learning to operate security systems on US military bases that will soon be transferred to their control. Those systems use biometric information to screen workers entering the base, since fingerprints and iris scans can’t be faked like identification cards. Pratt acknowledged concerns about sharing the database, but he said information that would identify an individual’s religious sect or tribe had been excised. But Nouri said any information on Iraqis who have worked for the US military, including data in the base security systems, could be used for harm. The collection in Iraq is part of a global attempt to find and track terrorist suspects. Stephen Morris, deputy assistant director of the FBI’s Criminal Justice Information Services Division, said the bureau helps dozens of countries collect biometric information, usually in exchange for access to data. The FBI has agents stationed in Jordan, Italy, Mexico, Germany, and elsewhere to organize “fingerprint exchanges’’ of thousands of terrorist suspects. Many countries give access to criminal fingerprints but restrict the sharing of fingerprints of ordinary citizens. But in Iraq and Afghanistan, the US military has authority to collect such information as a tool to protect troops. Today, the Pentagon’s database, which is kept separate from the FBI files, contains information on some 4 million people from around the world, about 40 percent of whom are Iraqis. Officials would not divulge from where the rest of the information was gathered. After the military’s incursion into Fallujah in 2004, US soldiers collected fingerprints and iris scans of every resident as they passed through checkpoints to return. They wanted a record of the legitimate residents, so they could detect infiltrators. In parts of Baghdad, US soldiers went door to door, collecting information. They also enrolled entire villages at the request of tribal leaders. The information was useful because it could be mined for patterns, said Peter Higgins, a consultant who worked with the US military in Iraq on biometrics in 2005 and 2007. “If somebody was there when a bomb blew, and then they were there when the next bomb blew up, that’s a clue,’’ Higgins said. The US military set up forensic labs on military bases to study the fingerprints taken off improvised explosive devices or weapons caches and compare them with individuals in the system. An estimated 2,000 suspected insurgents have been discovered this way, according to Pentagon officials. At least 365 Iraqis who applied for refugee status in the United States have been denied because their fingerprints turned up on a list of known terrorist suspects. The database is viewed as such a success in the US intelligence community that some are worried counterterrorism efforts will suffer once US troops stop collecting data. But others hope the 50,000 US soldiers who remain in Iraq over the next year will train Iraqis to expand the database. Iraq’s ambassador to the United States, Samir Sumaida’ie, said he would like to see Iraq’s government use it fight corruption. But Sa’ad Al-Izzi, 36, a former New York Times reporter who fled Iraq after he was threatened for working with Americans, said he fears such intelligence cooperation between the United States and Iraq will cause problems.